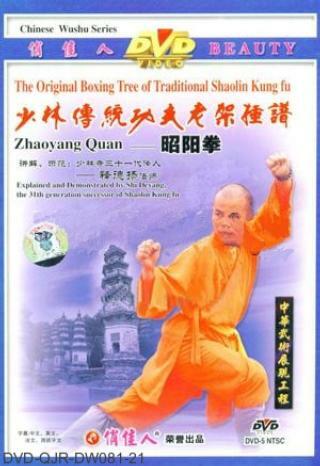 Shaolin Zhaoyang Fist (Shaolin Zhaoyang Quan) was created by the monk Zhan Quan of Qing Dynasty (AD 1644-1911) based on the foundation of Rising Sun Fist (Zhaoyang Quan) integrated with combat techniques. The arrangement was finalized after thorough refinements and sublimations. It features with simple footwork, swift attack, rely heavily on leg techniques to overcome the opponent, to attack by jump in from far away, to counter attack by dodge and suffer. This routine stresses on techniques such as leap, writhe, roll, arrow, empty bullet and fly kick to attack the opponent's key parts of his lower body. Although upper body of arms, elbows, fists and head bump are also used, these are merely for defense purpose while seeking chances to attack. That is to say that you use your upper parts to lure your opponent to concentrate on his upper body while attack him from below. Your attack will then be unpredictable and able to overmaster or disable your opponent. This is considered to be one of Shaolin's unique skill.